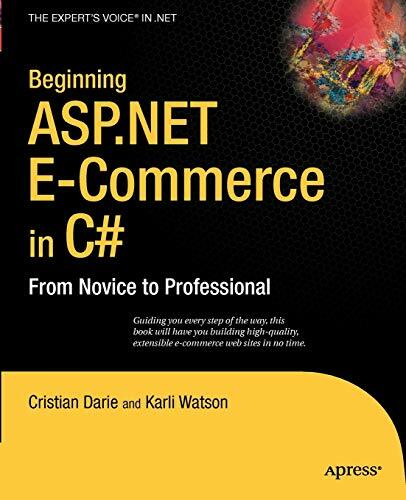 [PDF] Beginning ASP.NET E-Commerce in C#: From Novice to Professional (Expert's Voice in .NET) | Free eBooks Download - EBOOKEE! Description: Product Description: The book teaches the reader how to build a complete e-commerce web site written in ASP.NET 3.5 by taking them through the entire design and build process. Uniquely, this book shows how to handle payments through PayPal and DataCash meaning that the reader is left with a fully functional e-commerce site at the end of the book. The previous edition sold 3,269 copies and still sells 80 a month two years after its release. No comments for "[PDF] Beginning ASP.NET E-Commerce in C#: From Novice to Professional (Expert's Voice in .NET)".